I often complain about creationists, and about as equally often I hear back “why bother with them”. Well, I bother because they’re incredibly harmful to science education, as new research on a creationist textbook confirms. 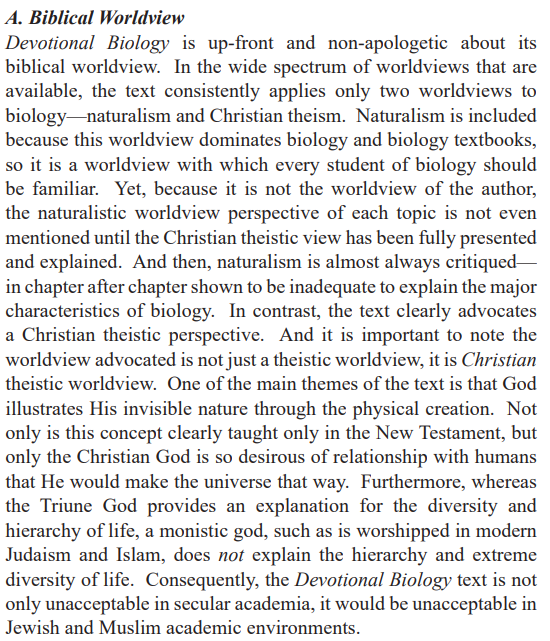 The creationist textbook in question is Devotional Biology, written by a creationist for a creationist to teach a biology course at a Christian university. In other words, the deck was stacked way in their favour1. And yet followup research shows students learnt far less than in a similar secular scenario2. What’s worse, this discovery was made by creationist researchers; presenting at the International Conference on Creationism, one of the premiere creation science conferences3. Basically, this is the best they’ve got. And it’s a pile of trash. 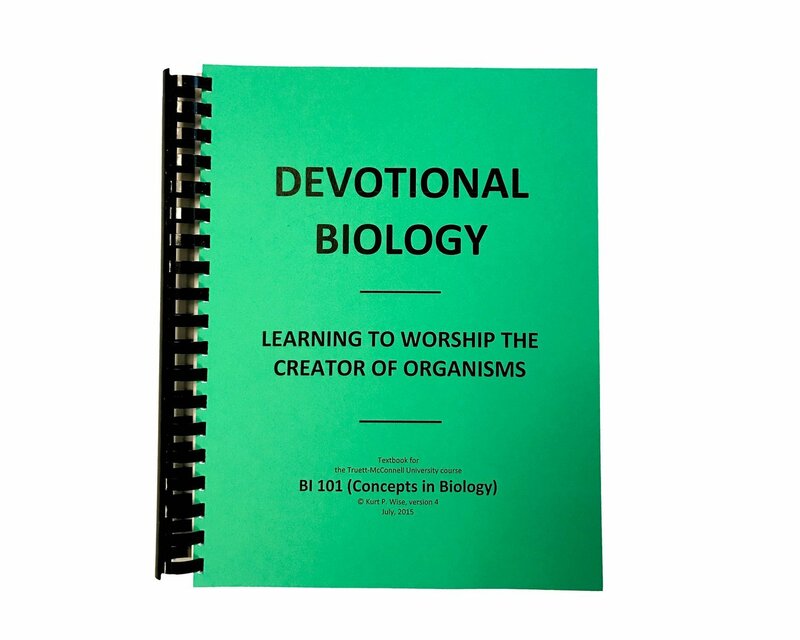 The creationist textbook Devotional Biology was created by Dr Kurt Wise for use in the classes he taught at a Christian college. Specifically, it was designed for an introductory 101-type course available as an option to all students, not just those doing biology1. He wrote this creationist textbook, rather than simply buying one, because the thought he could provide important information not readily availible in other books. Things like how the universe was designed for us 6,000 years ago, how Judaism can’t explain biology, the ethics of hunting and abortion, the existence of evil, and much more1. These impressive results amount to 36% of students claiming they know more about biology than when they started the course. But just how spectacular is this statistic? Enter Ziegler and Montplaisir, who were curious about a similar thing in similar circumstances; albeit in a proper science class without shunning evolution. They too examined an optional introductory biology course at a university, open to non-biology students. They also gave quizzed students on how much they thought they learnt. There were some differences between their work and Dr Wise’s study. Apart from being based around evolution, rather than creationism, the main difference was that this was a second-year course. But still, the circumstances were very similar. Dr Wise’s survey seems to show his textbook in a very good light. 85% of his students reported having learnt something new about biology during the course1. This sounds very impressive until you compare it to Ziegler and Montplaisir. In their study, pretty much everyone on the course learnt something about biology2. They broke their results down into more detail too, revealing most had learnt a fair bit. Specifically, they were interested in 24 biological concepts covered in their course. Things like genetics, osmosis, natural selection, etc. Going in, the average student claimed to know 10/24 of these biological concepts. By the end that had increased to 18/24 of the concepts. Everyone claimed learnt something, with most close to doubling how much they thought knew2. Is this better than in Dr Wise’s class? He doesn’t provide such depth, making it difficult to say. Such a surface level examination of his class isn’t the only issue with his study either. Now, by this point, you may have noticed that I’ve only talked about self-reported results; i.e. how many students said they learnt something? That’s because this is the only data given by Dr Wise. However, if you’re anything like me you’re probably wondering how much these students actually learnt. And are also probably skeptical that self-reporting is a good way to find out. More scientific research would agree with us, and so its long been practice to pair these self-reported results with actual tests of knowledge. These typically confirm our skepticism: people overestimate how much they’ve actually learnt off a course2. A sort of Dunning-Kruger of education. Returning to Ziegler and Montplaisir, they found their students also followed this pattern. Whilst ~75% claimed to have learnt the concepts taught in the course, follow-up tests found that only ~50% of students actually had the knowledge2. 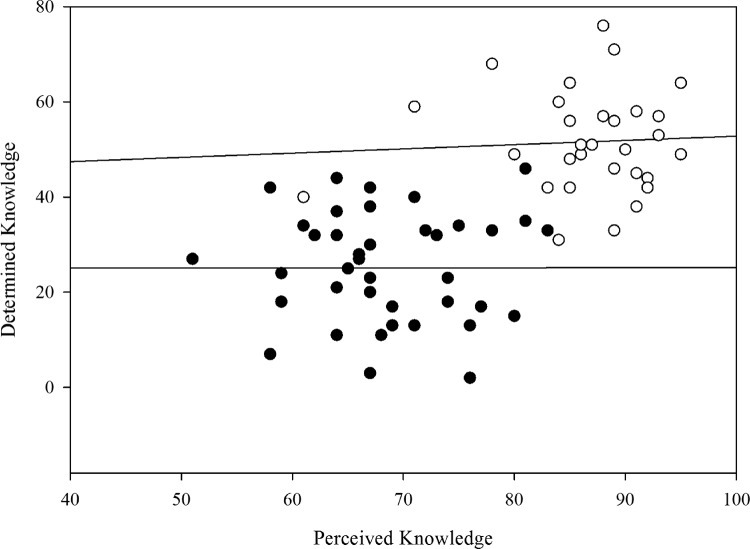 Actual knowledge v. perceived knowledge before the course (black) and after the course (white). Note the lack of a correlation in both groups2. This makes the poor performance of Devotional Biology even more scathing. Not only do they think they’ve learnt less than people in a proper science class, but the amount they’ve actually learnt is even lower. All of which is just depressing. All the cards were in the creationists favour in this one. It was their course with their textbook at their school. Despite this, they produced a completely atrocious biology education. So the next time someone asks why you should bother with creationists, point them to this. We should bother because when they get power, they ruin science education. All of which makes the fact they’re trying to spin this creationist textbook off into a high school course that much more terrifying. pp. 255-267. Pittsburgh, Pennsylvania: Creation Science Fellowship. Ziegler, B. and Montplaisir, L., 2014. Student perceived and determined knowledge of biology concepts in an upper-level biology course. CBE—Life Sciences Education, 13(2), pp.322-330. Whitmore, John H. (2018) “Preface,” The Proceedings of the International Conference on Creationism: Vol. 8 , Article 1.